On 23 Dec 2014, Kyrgyz President Almazbek Atambayev signed a document, which brought his country into the fold of the European Economic Union Treaty. Talks on the conditions of Kyrgyzstan’s joining the union lasted literally until the very last hour. A source in the Kyrgyz foreign ministry told Fergana about how this happened and what was achieved. Kyrgyz Minister of Economy Temir Sariyev told an interview with the RFE/RL’s Kyrgyz language service – Radio Azattyk: “Until today, the president and government spoke of Kyrgyzstan joining the EEU only in case the Kyrgyz side’s conditions are met. All of our proposals and demands were met, and only then the president signed the agreement. Before we remove customs checkpoints between [Kyrgyzstan and] Kazakhstan, we must equip [other] customs checkpoints. These are the airports in Osh and Bishkek, and the Torugart and Irkeshtam customs points. Kyrgyzstan will experience the practical benefits of this move over the next several months. In accordance with the “roadmap” to join the EEU and the Customs Union, Kyrgyzstan will receive assistance from its neighbors to equip and furnish its borders. 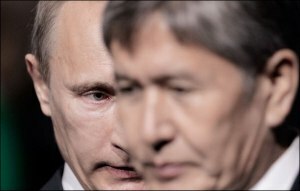 Russia and Kazakhstan will provide 200m and 100m dollars, respectively, and Kyrgyzstan will not be obliged to return them. The Kremlin will provide said amount in the form of cash, while Kazakhstan will grant its neighbor with cash and some of the equipment it has recently purchased to equip its own borders with Kyrgyzstan. By 9 May 2015, as the heads of state agreed, there will be four border and customs checkpoints between Kazakhstan and Kyrgyzstan, which will function in the new simplified mode. The simplification of border crossing is expected to ease the difficulties motorists and regular citizens face when visiting their neighbors. All other common checkpoints will be added to the pilot four checkpoints later, since Kyrgyzstan will only be able to equip said checkpoints by early May. Obviously, there are “painful” aspects of the agreement—Kyrgyzstan has to forfeit income it receives from re-exporting goods from China, Turkey and other countries to Kazakhstan and Russia. This [forfeiture] will significantly impact the country’s largest markets. However, the problem is not that dramatic, as the re-export has already been dwindling for a year after Kyrgyzstan joined the Customs Union.